Outside of Ys, not a lot of Japan’s computer JRPGs have made it stateside. 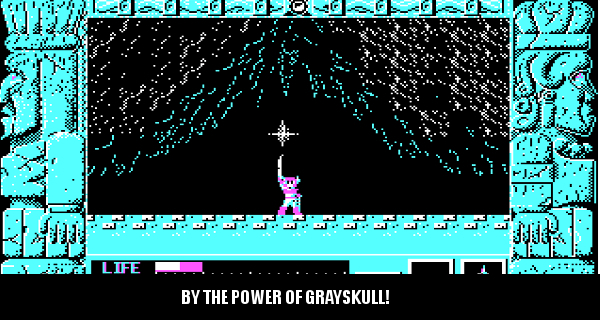 But back in 1990 Sierra ported over one of Game Arts’ notable action RPGs from the PC-8801 to MS-DOS. Game Arts should be no stranger to you. They helped Nintendo, and Sora develop Super Smash Bros. Brawl on the Wii. Before that, they spent many years putting out role-playing games. The biggest being the Grandia, and Lunar series. Games that are still sought after, and played today. PROS: Scalability (for the time). Great soundtrack. Dungeon crawling. CONS: Occasionally wonky controls. Generic story. May have issues under DOSBox. THANK HEAVENS: The manual came with dungeon maps. At a first glance you might not care about Zeliard. The box art has an almost Mega Man 1 quality to it. If all you had to go by was the cover, you would think it was a game about a Viking who kills frogs. Once you install the game however, all of that changes. If you have an old machine, running the installer will ask you if you have a Monochrome, Hercules, CGA, EGA, Tandy, or MCGA display, along with asking with what sound card you have in your computer. This game was pretty scalable for its time. Back in the early 1990’s computer games were slowly taking advantage of newer hardware. But the people putting them out much like today, realized they couldn’t shoot for only the highest end. Zeliard even has a game speed setting for people to slow down or speed up the game depending on their computer’s processor. These days if you find a copy, the easiest bet is to fire up DOSBox, and run the game through it using an external floppy drive. Otherwise, you’ll have to hope you still have that old 286 in the cellar somewhere. Anyway, once you’ve made your choices on settings the game will fire up into a prologue setting up the storyline. Zeliard doesn’t have a very complicated one. It follows the path of other JRPGs. As a wandering adventurer named Duke Garland, you stumble upon the kingdom of Zeliard. It is here you learn that its Princess has been turned into stone by an evil monster called Jashiin. In order to restore Princess Felicia you’ll have to recover sacred stones called the Tears of Esmesanti. You’ll be granted some currency, use it to buy the most generic of weapons, and proceed. As you play through the game, like all JRPGs you’ll level up your character, find or buy better gear, and do a lot of exploring. Zeliard also eschews the usual top down, or isometric perspective. 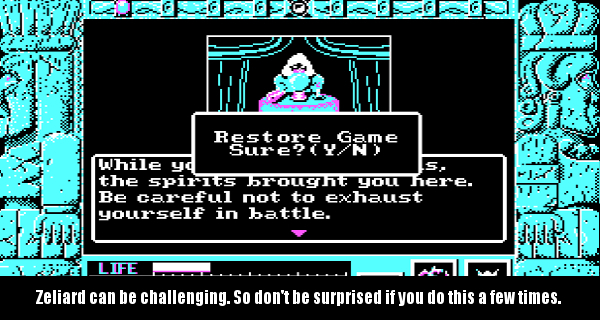 Instead it takes the approach seen in Zelda II: The Adventure of Link, and later in Ys III: Wanderers from Ys. Implementing a side scrolling perspective. This doesn’t really hurt the game though because you’re not coming into it after a previous game. This is just simply the way this game works. Zeliard follows the typical JRPGs tropes though. You’ll enter a town, talk to everyone, possibly get an item or two, then leave to go find an item, or grind your levels up. What is a little bit different though, is that you don’t wander off through a lot of terrain, and then find dungeons. Dungeons link the towns. So when you leave the very first town you’ll find yourself in a dungeon maze. These are designed pretty well, giving you a large variety of enemies to kill. Kill them, get the loot drops, and then head back to the town to buy better gear. Or find what you need to find, and get to the exit leading to the next town. The game can become a big grind at times, because you’ll want to collect a lot of orbs from fallen enemies. These are called Alma. They can be converted to gold in the town banks, which can then be used in the item shops for better gear. Which you’ll definitely need for going up against the bosses. One genuinely novel thing about these banks is that you can actually have an account. Why would you want a bank account in a town in Zeliard? Because it keeps your cash safe while questing. Something else you’ll need to continually do is get magical powers, and life bar upgrades from the sages in each town.Sages also act as a save system. 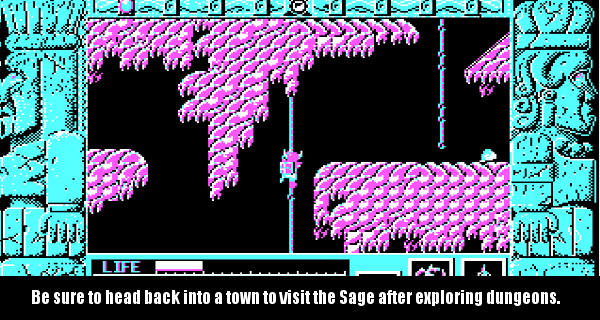 You can save your progress in each town by visiting the sage room. You can also save or load by pressing one of the function keys to bring up an option. The dungeons can also be intricate at times, sometimes intertwining, allowing for some convoluted routes. Some of which you need to take in order to find boss rooms, or the keys to enter the boss rooms. Zeliard has eight bosses leading up until the final encounter with Jashiin. If you have the proper items they’ll go down pretty easily. If you don’t, they’re going to be very difficult affairs that you can barely win, if you can win at all. In essence, it shares a lot in common with other action RPGs of the time period. The bosses range from typical to zany. You have the typical crab monster, or octopus. But then there are some silly ones, like a giant ice cube. One of the bosses is actually in a town rather than a dungeon. Something that kind of comes out of left field. Defeating bosses not only requires the right tools for the job, but learning patterns. When to jump, duck, or strike are things you need to memorize going in. So again, you’ll be firing up your save file a lot during your play through. You’re also going to want to stock up on health potions because one screw up on your part can lead to taking A TON of damage. The dungeon environments are thankfully pretty varied once you get around 25% or more into the game. There are a bunch of themes here, ice, mountain, water, fire, a tomb, and so on. While they’re not the most original, they do keep things from feeling quite so redundant. Each boss guards one of the tears. So with each boss you defeat, you get that much closer to restoring Princess Felicia. Beating a boss feels satisfying. Because there is a combination of the challenge involved, and a really cool victory animation every time you recover one of the tears. Since you’ll be spending most of the game dungeon crawling, you’re going to want to keep an eye on a stat besides your health bar. Your armor. Something Zeliard does that not many other games of its ilk did at the time is shield damage. Not only will enemies sap your health, but they’ll also damage your shield. If your shield takes too much damage, it will actually break, leaving you with no defensive power. You’ll have to enter a town, and buy another shield. If you die that can make things tough, as deaths cost you alma, and gold. Unless you stored it in your account. Thankfully, you can load the last save before your most recent demise. But if you die after doing an awful lot of stuff, expect to be frustrated. Because you’ll have to do all of it again. If you fail after that? Another saved game load. One thing Zeliard especially excels in is music. The game grants players with a pretty awesome soundtrack. This game has some of the best chip tunes of any computer game. They’re catchy, fit the theme of the game excellently, and you’ll be humming them after playing. They are that good. Thumping rock tunes. Triumphant, orchestrated symphonies. Even if you decide to run this on an old XT you have sitting in the attic, and you only have a PC speaker for sound, it’s still pretty passable. They also did a fairly good job on the graphics. While running anything less than maxed, admittedly hasn’t aged well, it does look better than you would expect. Really, if Zeliard has any troubles, aside from looking old, it suffers from excessive backtracking. A lot of games make you go to earlier areas for items after you get to a higher level. But in Zeliard getting back to some of these sections is really complicated due to the maze doors in the dungeons. Another issue is it can sometimes have inconsistent hit detection. It isn’t so terrible that you can’t play, but once in a while you might take damage from an enemy that didn’t hit you very obviously. Sometimes this will prove difficult so you might find yourself reloading saves more than you might like. Finally, for those running the game under DOSBox, you might run into installation issues depending on your configuration. The worst case scenario here is that the game will only run in CGA mode, with PC speaker emulation. This won’t be everybody’s experience under the emulator. 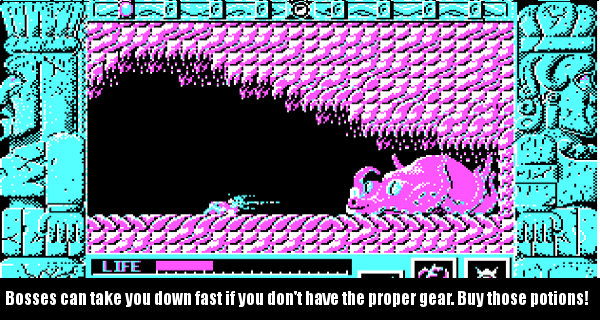 But at least the game is completely playable even if you are on a system forcing you into a very limited color palette. 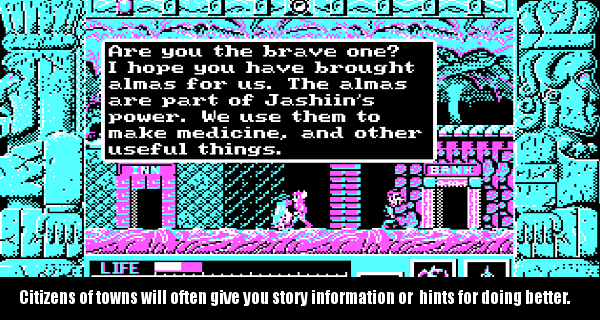 Still, Zeliard is a pretty good game, and a curious footnote in the history of Japanese computer games. Especially since it came stateside at a time when few computer JRPGs came over along with popular console games like Final Fantasy. JRPG collector’s should really track it down, as it’s an interesting part of gaming history. It won’t be the best JRPG you’ll experience, but it’s certainly worth looking into, and it does provide a fun campaign.